Heat oven to 375°F. In large bowl, stir meatball ingredients until well mixed. Shape into 1-inch balls; place in ungreased 15x10x1-inch pan. Bake 25 to 30 minutes or until meatballs are thoroughly cooked and no longer pink in center. Meanwhile, in 3-quart saucepan, stir sauce ingredients until well blended. Heat to boiling over medium heat. Reduce heat to low; simmer 5 minutes, stirring occasionally. Add meatballs to sauce; stir to coat. Cook over medium heat about 5 minutes, stirring occasionally, until thoroughly heated. 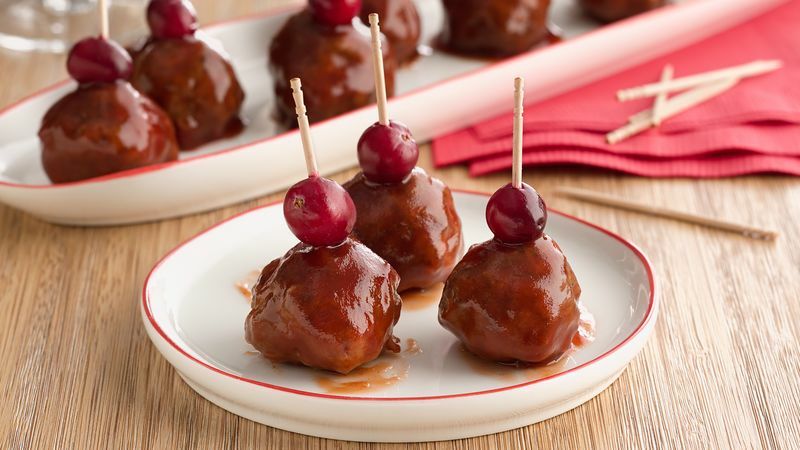 Thread cranberries on toothpicks; stick toothpicks in meatballs to serve. Prepare and bake the meatballs up to 24 hours before your party. Cover and refrigerate them. Just before serving, prepare the sauce and heat the meatballs in it. Keep the meatballs warm by serving them in a chafing dish or fondue pot. Provide small forks or cocktail toothpicks for easy eating.